Transplanting will likely be the most traumatic event in your young tree’s life. Nursery trees are pampered to grow fast. So when you sever 90% of its roots (ball-n-burlap) or allow roots to circle its pot for years, drop it in a tiny hole of compacted clay soil (“drill-n-drop”), and greatly alter its watering cycle, it should come as no surprise when your tree struggles to survive. To the tree owner, all new installations look great; there is the promise of flowering ornamentals and spreading shade trees. To the landscaper, the market is incredibly competitive and those who do more than necessary risk going out of business. But it’s the tree owner left holding the ailing tree. And often it’s our company that gets to claw through wire cages, nylon straps and girdling roots, to correct what should have been done properly by the landscaper (photos copyright Randy Cyr). Over half of all trees “professionally” installed in the Upstate will die or fall over within 5 years. That is astounding! Of the thousands of trees we have installed and/or provided planting specifications for, less than 1/2 of 1% have died or fallen over before becoming established. That is a 100 fold improvement! But how can this be? If the planting photo above looks strange, it may be due to the fact that few landscapers follow the guidelines of our universities and trade associations. Also, we are having to overcome horrific nursery stock, and manufactured landscapes, stripped of topsoil, with poor drainage. Besides our own research of personally digging up tens of thousands of ailing trees here in the Upstate, we have benefited from the research of Dr. Ed Gilman of the University of Florida, and Sandy Rose of Shade Masters, Arlington, Texas. In our model above, we purposely chose an abused, end of season, K-mart special, that nobody wanted. It had been sitting in the same pot for years, with prolific circling roots (C above), buried roots flares (F above), multiple stems and a thinning crown (not good; not good at all!). We chose the most compacted, anaerobic clay soil we could find. Billy Neighbors spent a day swinging his pick axe to dig this relatively small hole. By merely following our planting instructions below (A to Z), without fertilizing, amending, and irrigation, this 6-foot tall American hornbeam (a small, slow-growing SC native), grew to over 19 feet tall in only 3 years (Z above). That is over 4.3 feet growth per year (a few inches a year is far more typical)! We have seen similar growth with several other species. These are not anomalies. Owners and managers: ask your landscaper how much more will it cost to plant properly. If they truly are “professionals”, they should at least make the offer, and let you decide (because, quite frankly, tree planting as it has been in the Upstate, just ain’t getting it!). If you want a high survival rate, and for those survivors to thrive, consider following our proven model. Paying a little extra now, to have your trees planted properly, will be well worth the cost! BTW, we no longer install trees. Nor do we accept referral fees. We are only providing you this invaluable information as a service to the great people of the Upstate! If you’re like most folks, you disdain instructions; especially this many instructions. But if you really want your tree to take off, rather having to fuss over it, and eventually paying someone to come to your aid, you need to follow these basics. They are all here for good reason (much thought and research is behind each individual instruction). We have consistently seen great results through the years. So can you! (C) The best time to plant is November through April (this American hornbeam was planted in late October). (D) Plant in well-drained soil away from foundations, walls, drives, parking lots, bedrock, downspouts, drains, plumbing, septic systems, utility lines, billboards & other trees. (E) Call 811 (The National Call Before You Dig Line). (F) Moisten rootball. Gently pull from container. With a hand cultivator expose root flare (F) by gently digging to the first sizable root. Lower (shave, dig and/or prune) the rootball to this level. (G) Measure rootball height. Gently return to container. (H) If drainage unknown, conduct a percolation test (s). With post hole digger dig down 2 inches less than rootball height. If dry for 4 hours, fill with water. Acceptable drainage is 1 inch to 1 foot per hour. Poor drainage? Test another site. (I) Remove sod with flat shovel 5 times root-ball width (7 times for compacted soil). (J) Dig planting hole (non-saucer-shaped) 3 times rootball width (5 times if compacted), and 2 inches less than rootball height deep (G). (K) Dig hole 2 inches deeper near the sides. (L) Roughen sides & bottom of hole away from center. (M) Gently pull rootball from container. Tease circling roots away from moistened rootball. Prune kinked & stubborn roots. (N) If impractical, carefully shave off or prune outer mat of circling roots (C) with a machete or large knife. (O) Place rootball on firm ground in center of hole. The root flare (F) must be 2 inches above sides of hole (J). Use board or garden tool handle to compare. (P) Orient tree so most leaves face south (or towards most sunlight). (Q) Straighten tree: align trunk with the side of 2 buildings in background. Remove props, twine & ties. Spread out loose roots away from rootball. (R) B & B tree: remove nylon straps, twine, wire & burlap from top & sides of rootball. (S) Stake unstable trees against rootball with untreated wood in direction of prevailing winds (southwest & northeast). (T) For additional support, attach opposing, wide, non-chaffing straps low on the trunk. Guy lines are not recommended. We have planted numerous 25 foot tall trees without using guy lines; none of them have failed. (U) Place 4 inch ADS/PVC pipe (s) near rootball to monitor drought & flooding. Water or pump out water as needed (manual bilge or battery-powered siphon pump). (V) Backfill planting hole with same soil broken up & lightly tamped down alongside rootball (do not amend soil). Miracle-Gro may be moderately applied over poor soil. 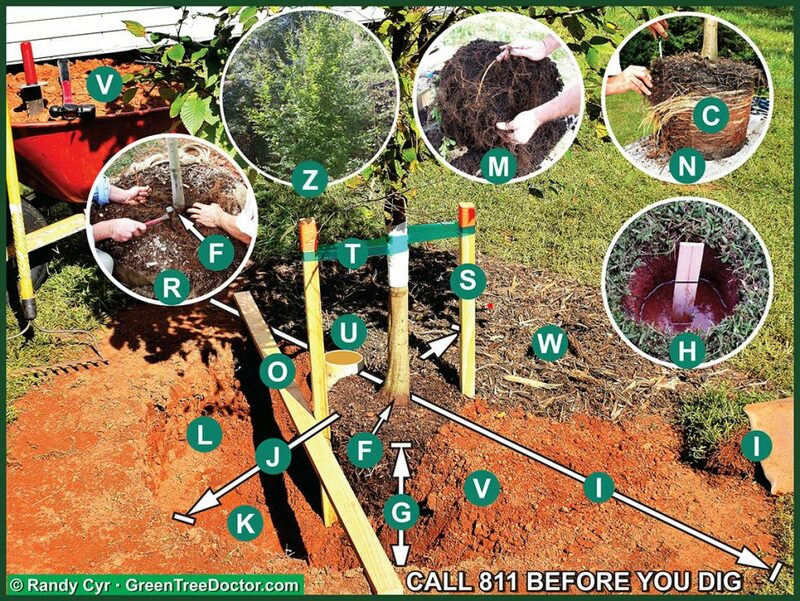 (W) Apply 1 inch, single-ground, aged, whole-tree, wood-chip mulch over backfill & sod-stripped soil (leave rootball bare). (X) Drench entire planting hole (J). Repeat when water has drained (monitor pipe). Drench entire rootball (G) once every other day for 2 weeks, twice a week for remainder of growing season (April thru October for deciduous trees). These are only general specifications, and may have to be modified according to your tree and conditions. Watering frequency is dependent upon rainfall & temperature. <90% of 1st year tree deaths are due to water mismanagement. (Z) By merely following our planting instructions above (A to Y), without fertilizing, amending, and irrigation, this 6-foot American hornbeam (a small, slow-growing SC native), grew to over 19 feet tall in only 3 years (Z above). That is over 4.3 feet growth per year (a few inches is more typical)! The root flares should remain exposed for the life of your tree. Start tree training in about 2 years (as needed). Like our children, some trees may require decades of training. 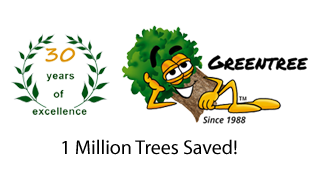 Don’t be surprised if your tree grows amazingly fast, with few, if any pest problems! Trees want to grow. We just need to provide them a reasonable chance. Now on to the slideshow.